We are taking a preemptive move on the weather this weekend as it looks to be icy at best. With that we are going to push this all into January/February as a number of people telling us December was tough and the 17th was a hard date for some who already signed up due to holidays. We are going to kick this off in the New Year – again on Sundays and starring on Jan 6th, 1:00 to 3:00 at Embry Mill. We going to reduce the fee to $65 (all those paid we will return $20 to you at the start). Again the concept is a position style NCAA lacrosse practice for 1.250 hours and then 40 minutes of coached scrimmage. What does that mean? The practice part is fast paced, to keep the players moving and conditioning, but FUNDAMENTAL driven. The scrimmaging we will let them play full field with coaches on the field reffing and coaching – helping them see what they should be seeing. Doing what they need to be doing “off-ball”. Rising Lax IQ. Results should be: Solid fundamental reinforcement and practice, better conditioning and increased Lax IQ going into the Spring Tryouts for HS ball. Additionally they will have seen many of the same drills used by Prospect Camps all over the country, so they should have a comfort level knowing the drills and perform better while being evaluated. Lastly as part of this session, we will be hosting during a weekday evening in January (day TBD) a “how do I get recruited” seminar. A short presentation of the do’s, don’t bother and never ever do. Followed by questions and answers. 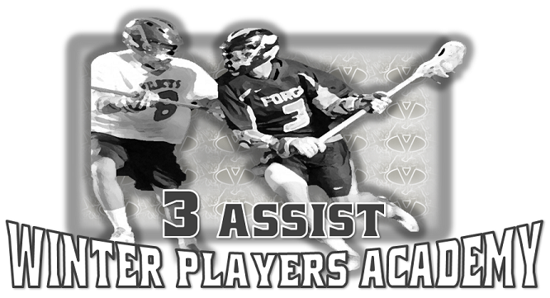 3 Assist Winter Players Academy mission is to assist in improving players of all levels of play, from those making the jump from youth to high school and from your JV team to your Varsity team. Spots are limited to the above numbers, once filled, players will be used to fill additional/2nd session. Would you like a new head for the Twenty-19 season?!? You can win one, be tops in ASSIST and win a free head for the spring season. Notch 3 Assist in a winter game to qualify. Out of the players that qualify, one will be randomly drawn at the last session to win a free head! Because an assist equals a goal which equals a point.